If you are a parent or someone dealing with a spelling problem, you’re probably wondering where to start. On this page I’ll help you to work out where your child is having difficulty and offer solutions by using one of my students as a case study. 1. First, I find out what my student knows and what they don’t. It’s a waste of time teaching them how to spell words they already know. You should focus on what they don’t. 2. I’ll show you how to become a word detective and work out which patterns have not yet been grasped. Once you identify those gaps you can fix them. By teaching the appropriate spelling patterns or rules the spelling problem disappears. 3. The good news is that it’s really not as difficult as it sounds. 4. One of the best places to start with students who are writing reasonably fluently (even if their spelling is a problem) is to ask them to write about something they are interested in. I did this recently with 17 year old Jacob whose self-esteem was poor. His mother brought him to me saying that he had a serious spelling problem and that his teachers were concerned. I wanted him to relax so I asked him to write about what he would most like to do when he left school. The focus, I told him, was to get his thoughts down on paper rather than stress over his spelling. That way I could be sure he would write a reasonable amount giving me more words to analyse. Jacob let himself go and wrote about a page. That told me everything I needed know to be in a position to help. I complimented him on his ideas and discussed his dreams with him. One thing I didn’t discuss with him was his spelling problem. I didn't want him to feel self-conscious and uncomfortable. It was only after he had gone, that I looked to see exactly how he had spelled the words. I marked the spelling mistakes. And, at first glance there seemed to be lots of them! But instead of highlighting the entire word containing the mistake, I studied each of them and only highlighted the part of the word that was incorrect. By doing this I was able to the extent of Jacob's spelling problem and the pattern of spelling errors. I have rewritten what Jacob wrote below and have highlighted the errors to make it easier for you to read. Notice that many of the mistakes he made were made not just once, but several times. By fixing one spelling problem we would be able to fix several errors at once! When I leve school I want too be a supprot worker for yooth. I wont too work with yooth who have got themselfes in trubel. Thats because some off them dont now what there doing when their young. There branes are still to young to fungshin popraly. They havnt lerned how to think before they act. They just deside too do something and dont think off the conseeqinses . They make misstakes when they have parents or relashins who have been in trubel. I now that lots off them have mums and dads who dont care. Many of the words Jacob misspelled above are common spelling problems. In many cases when two vowels are side by side in a word (e.g. e and a in the word leave and a and i in brain) the first vowel says its name and the second vowel is silent. I dream of a meal of meat and tea at the beach. The remain of the brain went down the drain. Too is used for emphasis and to mean also e.g. Can I come to your house, too/ or You are too late to be in time for the concert. The shorter version, to, is often said quickly and is used when you are going somewhere or about to do something eg. I am going to the shops or I am would like to meet you in town. Jacob has visually remembered all of the letters in this word but not in the correct order. He needed to break the word into two syllables (sup and port ) by sounding out the word. He also needed to know how to spell the or sound in the second syllable. Jacob has not used the correct spelling of the /oo/ sound in youth. He probably thought it was spelled like the word tooth. There is another way of writing that sound. It is like the /oo/ in the word, you. The youth group had soup on tour. Jacob has written this word the way it sounds. But the rule is that after w, wh or qu the sound /o/ is often written as the letter a. What was the quarrel about at the quarry? This was a considerable spelling problem for Jacob. He made the same mistake 6 times. He didn't understand that all of these words are called contractions because they have been shortened. An apostrophe is put in the space where a letter has been left out to shorten it. don't is short for do not. The /o/ has been replaced with an apostrophe. haven't is short for havenot. The /o/ has been left out between the /n/ and /t/. what's is short for what is. The /i/ has been left out so an apostrophe has been put in to replace it. The word /them/ is plural as it means more than one. That makes it incorrect to use the word themselfes which sounds like a singular version of themselves. In fact there is no such word. The correct word has ves on the end. Part of Jacob's spelling problem was that he didn't realise that a word like leaf changes to leaves when there is more than one. The f is left off the word and ves is added to make it plural. There are two different spelling problems within this one word. The young country cousin was touched to meet her body double. le is the used more often that the other two so if you are stuck try le first. Many children and adults get of and off confused. This is a common spelling problem. When we say of, it sounds more like /ov/ because we tend to say it quickly. Here's an example of how it can be used... I have a lot of people visiting me." Off means to remove or be removed or to leave e.g "I am taking the dirt off my shoes." or" I am off to the shops now." Jacob found it difficult to know when to use there and their. An easy way to remember is to imagine that the /i/ in the word their looks like a person with a head. When their is used, it is often in connection with people and something that belongs to them e.g. "The children left their books behind" or "Look at their excellent written work." The other spelling of there has the word here buried inside. Take the sentence... "The ball is over there." If you are unsure which to use, ask yourself whether or not you could use loosely use the word here instead of there. If you could say" The ball is over here" you can safely use the there spelling. Are their toys there on the shelf? Jacob's spelling problem here is that he does not realise that there is a silent letter at the beginning of the word know. Many years ago silent letters like the k in know were pronounced but these were later dropped. When learning to spell this word, it's a good idea to say the silent letter when practising it. The knight had the knack of putting a knot in his knee. There are two spelling problems here. Jacob thinks the word is written beginning fung rather than func. Perhaps he hasn't heard it correctly pronounced or seen it written before. The /sh/ sound is written as sh only at the start of a word and the end of a syllable. 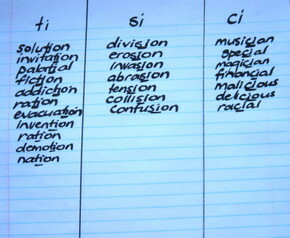 At the beginning of the second/third/fourth etc syllable in a word e.g func/tion it can be spelled with ti, ci or si. The ti occurs more often than the other two so try it first if you are stuck. Jacob was relying on his visual memory when he spelled these words. He remembered most of the letters, but was unable to write them in the correct sequence. He could have solved this spelling problem by sounding out their individual syllables e.g. The bird learned to turn the fern for worms. When we pronounce consequences, the second syllable says se (with a short e vowel) rather than see (with a long e vowel). The letter q always has a u beside it. The queen's request was to squeeze the quiet quail. When the letter /c/ is followed by e, i or y it makes the c sound like an /s/. This type of /c/ is called a soft c.
It took a century to ride to the city on my bicycle. The same rule applies to the letter /g/. Often if e, i or y comes after the g, it makes a soft g sound. The gentle giant loved gymnastics. The word mis/takes is made up of two parts. The first part, mis, is called a prefix because it is fixed on to front of the word and has a special meaning... wrong. If Jacob had known that the first part of the word was a prefix he would not have spelled it with a double /s/. There are many other prefixes and suffixes (which go at the end of words) and each has their own meaning. I would work through each of these spelling problems with Jacob one at a time and at his pace. After discussing the patterns explained above, I would get Jacob to practise them. Next I would dictate words with similar patterns, then sentences with them in, until I was certain that he could spell them correctly.